2013년 2월 25일 부터 개최된 MWC에 참석 하였다. - Reserve an events venue?? 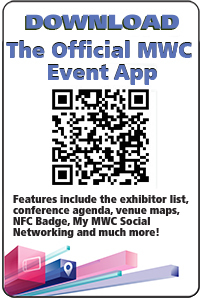 Download the official MWC event app now to have all the event information in one place. 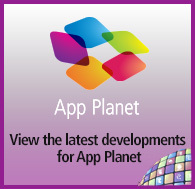 Now available on Windows 8, in addition to iOS and Android. To download all venue transportation information together in one easy to read, printable document, please click here. The conference sessions start early at 9:15 Monday morning so please leave plenty of time to register. Learn more now. The new venue also includes more dining options with more food choices and faster service. View the full list of catering locations with a dining map. 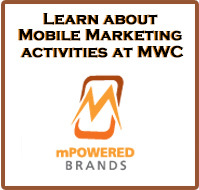 Network with My MWC and the Event App: Network with other attendees, browse the conference agenda, search for exhibitors and follow MWC on Twitter with My MWC. 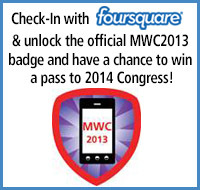 This tool automatically synchs your information with the MWC event app. Join today. 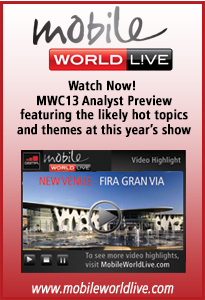 Check out GSMA Seminars: Open to all MWC attendees, GSMA Seminars provide insight and developments on key GSMA and industry initiatives. 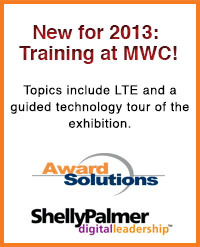 Topics include NFC, Rich Communications, mEducation and others. See the complete agenda. Use your NFC Handset as a Badge: Use your NFC-enabled handset to take advantage of NFC technology throughout the venue and Barcelona. The NFC Badge will allow you to enter the venue through dedicated entrance lanes without repeated ID checks; watch the NFC Badge video now. 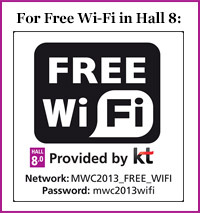 Then use NFC to get information and discounts at the ten NFC Interactive Zones around Fira Gran Via. 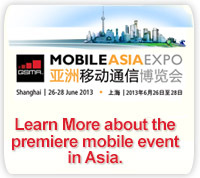 Learn more now about the NFC Experience and go back into the registration system to opt in. 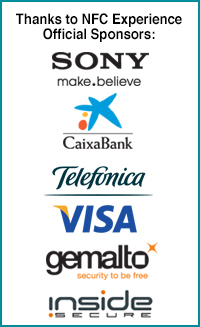 Official Sponsors are Sony, La Caixa, Telefonica, VISA, Gemalto and Inside Secure. Exciting Lineup of Partner Events: Learn about exciting new programmes and trends in the mobile ecosystem by attending sessions led by AirWatch, Applied Innovation, Catalonian Government, ClickSoftware, Fastback Networks, GTI, IBM, MasterCard, MobileMonday, Open Mobile Alliance and Taisys. Click here for more information and apply to attend. Attend the Forum Series: The Forum Series consists of THREE FREE EVENTS this year: the LTE Forum will be presented by ZTE; the Mobile Security Forum is presented by AdaptiveMobile, AVG and Juniper; the MNO Developer Cloud Forum is presented by Metaswitch Networks and ZTE. Apply to attend now. Cocktail Receptions in the NEW Networking Gardens: Our eight new Networking Gardens will be the place to be Monday night 25 February when we hold complimentary cocktail receptions. The fun starts at 17:30 with free drinks, food and entertainment. Learn more now. connected Aston Martin bicycle that tracks your health, a robotic virtual teacher and an electric scooter for smart city transportation, as well as cutting-edge connected solutions by AT&T, Deutsche Telekom, GSMA, KT, Telenor and Vodafone. Learn more now. Visit the NEW Mobile World Centre: As a part of the Mobile World Capital Barcelona initiative, the Mobile World Centre is a state of the art exhibition showroom where visitors can experience how mobile is enhancing our lives. Revisit the first ever mobile device, marvel at the future concepts, discover new mobile apps or experience Augmented Reality. The centre, located on Plaza Catalunya, Calle Fontanella 2, opens to the public on 15 February and regular hours will be Monday - Saturday from 10:00 ? 22:00. 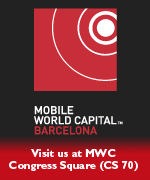 Sign up for a guided tour on the Monday or Tuesday of MWC by emailing centre@mobileworldcapital.com. Learn more now.